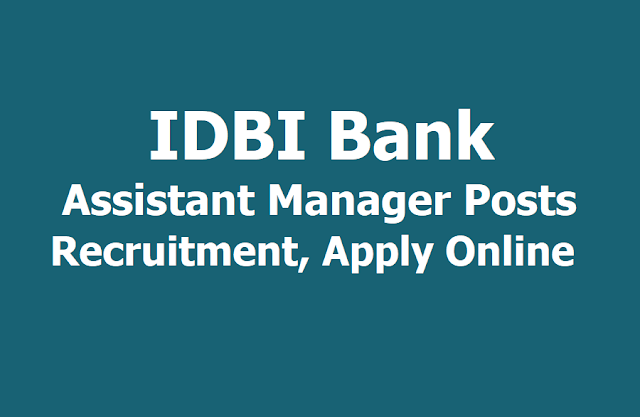 The IDBI Bank has released notification for the recruitment of Assistant Manager vacancies. The candidates who are interested and eligible can visit the official website of the IDBI Bank to apply for the posts. The online application and fee payment window for the same opened on April 4, 2019. The candidates can visit the official website of the Bank to submit their applications. The last date to apply for the IDBI vacancies is April 15, 2019. The Bank will also provide a Pre-Examination training for the SC/ ST/ OBC applicants at all centers. The training will be held from May 6 to May 11, 2019. The tentative date of the online recruitment test is May 17, 2019. A graduate in any discipline from a recognized institute is eligible to apply for the Assistant manager vacancy. Candidates belonging to general and OBC category must have minimum 60 per cent marks in their graduation degree. Minimum required percentage for SC, ST and PwD candidates is 55 per cent. Applicants must be 21 years old and should not be older than 28 years as on march 1, 2019. Relaxation on upper age limit for reserved categories is as per the Government of India guidelines. Applicants are also expected to be proficient in computers. The application link is available on the bank's website. Candidates belonging to SC/ST/PwD categories have to pay only the intimation charge of Rs. 150 while all other candidates need to pay Rs. 700 as application fee. b. Applicant must be either (i) a citizen of India, or (ii) a subject of Nepal, or (iii) a subject of Bhutan, or (iv) a Tibetan refugee (who came over to India before 1st January 1962) with the intention of permanently settling in India or (v) a person of Indian origin, who have migrated from Pakistan, Myanmar (formally Burma), Sri Lanka, East African Countries of Kenya, Uganda, the United Republic of Tanzania (formerly Tanganyika and Zanzibar), Zambia, Malwai, Zaire, Ethiopia and Vietnam with the intention of permanently settling in India. Provided that an applicant belonging to categories (ii), (iii), (iv) or (v) above shall be a person in whose favour a certificate of eligibility has been issued by Government of India. The applicant, in whose case a certificate of eligibility is necessary, may be admitted to the selection process conducted by the Bank, but on final selection, the offer of appointment may be given only after the necessary eligibility certificate have been issued to him/ her by the Government of India. c. Candidates are expected to have proficiency in computers. d. The Bank reserves the right to raise or modify the eligibility criteria pertaining to educational qualification including percentage of marks secured at Graduation level. Depending upon the requirement, Bank reserves the right to cancel or restrict or curtail or enlarge any or all of the provisions of the recruitment process, if need so arises, without any further notice and without assigning any reason there for. Qualification: Graduation from a recognised University. Graduate with minimum 60% marks (55% for SC/ ST/ PWD). Candidates are expected to have proficiency in computers. Selection Process: The selection process will comprise of Online Test followed by personal interview of the candidates, who have qualified in the online test. The Online Test will be Objective in nature. 1. In order to download Result, the candidates who have applied for the above mentioned vacancies must open official website of IDBI Bank. 2. Here the candidates will have to choose the Career section for further procedure..
3. In this section the candidates will Have to follow the Result for Online Exam link under the title of Recruitment Notifications for admissions to Manipal School of Banking 2019-2020. 4. After clicking on the above mentioned link, the candidates will have to enter their Registration Number and Password and then click on Login.